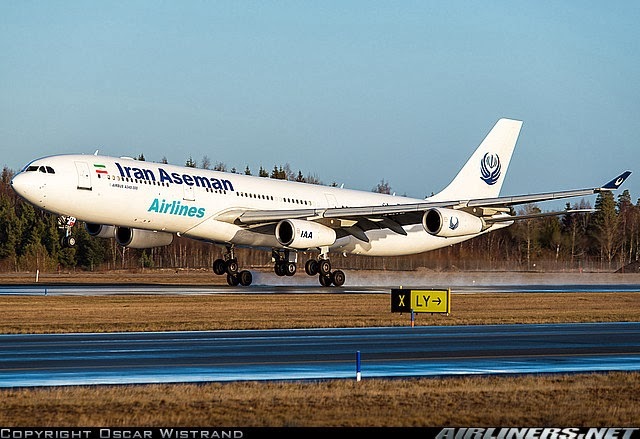 Updated livery for Iran Aseman Airline's flagship A340-311, reg: EP-APA (cn 002), landing at Stockholm - Arlanda (ARN / ESSA) on Dec. 29, 2013. Photo by Oscar Wistrand. 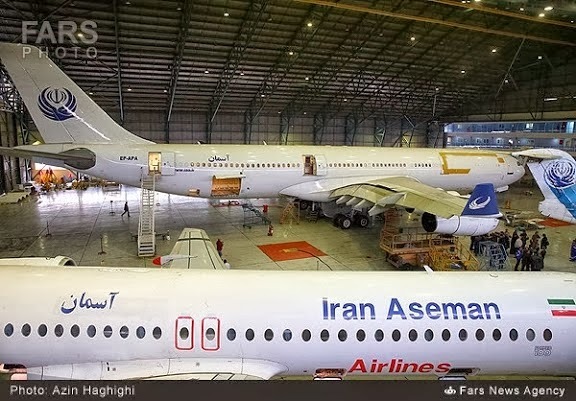 Iran Aseman EP-APA previously seen last Fall receiving attention at the airline's maintenance hangar facility at Isfahan Shahid Beheshti International Airport (IFN / OIFM). Photo by Azin Haghini at FARS News Agency. They want to replace Iran Air. Under the Shah Iran Air was, without exaggeration, arguably the top airline in the world similar to Emirates now. Westerners actually moved to Iran to work for it. Under these filthy thieving terrorist blaspheming dogs, Iran's airlines are all subpar toilet airlines that really no one should fly if they can avoid it. Anon at 2:49You are right: westerners came to Iran to service the Iran air. Nowadays, the Iranians do it themselves- they even make spares! Anon 3:59 AM......Is this why the state of Iran Air which before the "revolution" was second to none has become bankrupt and dilapidated? Please stop using worn out propaganda nonsense claiming that due to the "revolution" Iran can make "spares" for its airlines.Iran Air serviced its airplanes before the revolution. That is why they built those giant hangers in Mehrabad back in 1975.They used Iranian engineers and made up shortfall due to training with temporary western technicians. No one I know wants to use Iran Air if they can help it. They like to use Turkish airways or any other airline to go to Iran. A small Arab state like Dubia has managed to dominate the airline,shipping,banking and trade in the middle east and you're writing about Iran is able to make bits of "spares" for its antique airplanes at un-economical cost to the country. Anon 12:14, Spot on! It's like British airways trying to manufacture spares for its fleet. Just econonmic suicide ! Anon 3:59 there is no national airlines left for any Iranian to do it themselves let alone make spares! Sometimes you hear these statements that defy gravity so to speak. Iran Air makes spares for its aircraft. I have never heard of one carrier airline that has infra-structure to make spares for itself. To think that way is equivalent to nonsense like Emam Zaman is going to turn up sometime! Even a country like south Korea does go and create parts for its Boeing aircrafts. To build any significant part you will need a vertical integration chain comprising literally 10s of sub-contractors with an industrial strength to match. You hear all this about Iran is building some air defence system that would be on-par with Russia’s S-300. Next you hear that Iran is stating that Russia should honour its contract! So why if you are building the said air defence in Iran, Iran is still adamant that Russia should deliver the weapon. A fascinating example would be to look at Iran’s car industry. It started in 1960 by Kayyami brothers importing the old British Hillman Hunter in kit format to Iran and all has happened since that kit production has been moved to France and Far East. That is an industry that employs over a million work force in Iran but as yet cannot master the full production line for a Car. There is nothing wrong with it. Most auto manufacturers source their electronic parts from Bosh in Germany (as an example). If Bosh stopped supplying them they will have to turn into another supplier if there is one. So the idea of Iran Air building spares for its aircraft is just ridiculous! In a global supply chain it will not happen. Case in point as soon as sanctions hit Iran’s car Industry, the production went down by orders of magnitude. Anon 5:24 PM....True,and it exposed what a bunch of liars the regime consists of. Mocking the country's claim that it makes spare parts for its aircraft ,there you go -" i have never heard of one air carrier that has infrastructure to make spares for itself!.YET !-even a country like Korea does go and create parts for its Boeing air-crafts! . you say -a fascinating example would be to look at Iran's car industry , it started in 1960..........,that is an industry that employs over a million work force but as yet can not master the full production line for a car!.-YET there is nothing wrong with it.Most auto manufactures source their electronic parts from bosh German. If Imam Zaman turning up sometime is nonsense to you,does it seem too demanding for YOU to DIGEST this or someone placed a loaded pistol on your head to force you to believe it?.Why not stick to your forte!-,your clumsy mockeries and dismissive attitude of the country rather than abusing the 'democracy' on this blog to pock your nose on matters too difficult for your Demons to stomach !!. The only "lesson learned" by Iranians is not to trust an "arab style" Islamic Dictatorial Theocracy which is presently occupying Iranian land. All mullahs are closet arabs by nature. Anon 3:05 AM......The "vast bulk of iranian people" as you claim wished they never were tricked into believing these low life mullahs. Yes,people of your ilk always seem to have a lot of it !